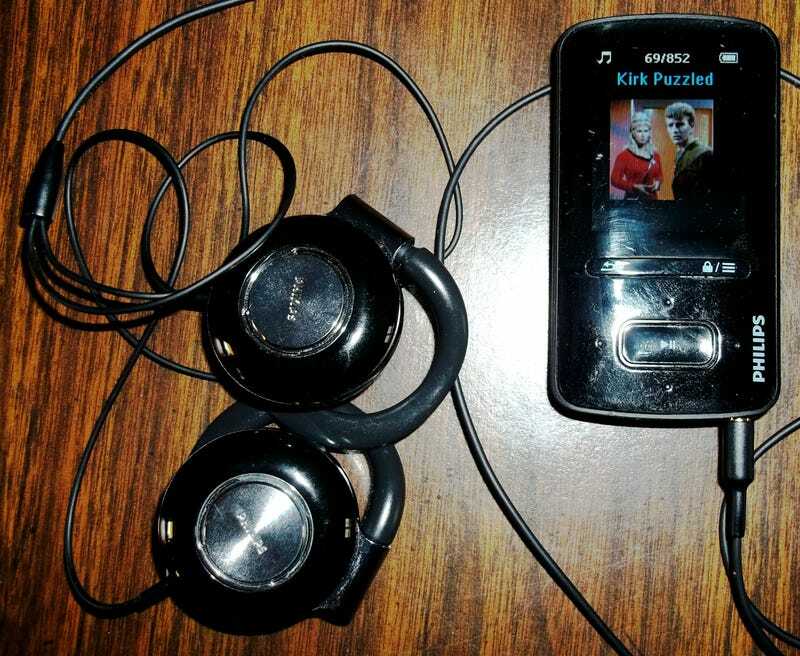 What Is On Your MP3 Player Right Now? How much memory to you have? Is it chock full, or do you have room for more? What format is your music in? I said "MP3 player" as a matter of convenience, but of course there are other digital audio formats out there. Is your preference something else? And if so, why? Is the music you have arranged in any special way? Is it just straight-up presentations of existing albums, or have you made any tweaks? If you have tweaked, would you like to elaborate? As for the player itself, I have a Philips GoGear Vibe with 8gb of memory. Of course, what they tell you a device has for memory never quite translates into how much usable space there is... Mine is crammed pretty full, and in the end there is only 7.04gb in the Music folder, and 2mb taken up by the Playlists folder. The music is in MP3 format. Stored on my computer, I keep my MP3s encoded at 320kbps. But before copying anything over to the MP3 player, I re-encode it at a measly 112kbps. Maybe my ears just aren't as awesome as those who swear by lossless formats and say anything else is garbage, but even at 112kbps, while I can tell a bit is lost when compared to 320kbps, it sounds good enough for everyday casual listening. And by compressing it down to 112kbps, I can fit a ton more within that 8gb 7gb! So, what music is actually on the player? Whoops, I forgot to expand the subfolders within the Alien Trilogy folder! Well anyway, the Alien and Aliens soundtracks are both the expanded soundtrack albums commercially available. I did expand Alien a bit further, however, by adding in the four tracks from Goldsmith's score for Freud that (much to Goldsmith's annoyance) were used in the final film, as well as the piece of pre-existing classical music that was used in favor of the end titles music Goldsmith composed himself. Back to the Future contains music from both the soundtrack album and the album containing Silvestri's complete score, with the songs from the soundtrack dropped in at the appropriate point where they would have appeared in the film. The music from II and III is just the original albums of the scores, but tracks have been rearranged to reflect the order they were in the films. Ghostbusters is, like with Back to the Future, also arranged by me to incorporate some songs from the soundtrack in with Bernstein's score. In the case of Ghostbusters, this actually involved some slight editing of tracks by me. I do own a lot of Doctor Who music, but presently have a sum total of only one track on my player. It as become something of a standard, staying on my player even if I don't have any other Doctor Who music on it at the moment. "Regenerations at 50" is a fan-made remix of the theme tune which takes every official version of the theme from the beginning in 1963 all the way through Matt Smith's series seven and blends them together so that they transition seamlessly from one to the next in chronological order, presenting a musical version of the fifty year history of the program. If you'd like to hear it for yourself, you can find it here. "What is the In Japan Origins Trilogy?" you may be asking yourself. Well, it is a trilogy of stories, two of which I wrote and the middle one of which a friend wrote for me, which I then (for fun) assembled soundtracks for using some of the music I own. If by any chance you are curious for more info (and also would like to listen to them for yourself) you can find all of that on this page here. James Bond gets the complete soundtracks to the first seven films, but the rest of them just get to present their theme songs. For Macross: Do You Remember Love? I took music from the three-disc album "Macross: The Complete," which covered both the original television series and this film, and arranged a folder of music to match as close as possible to the music as heard in the film. Occasionally this involved a wee bit of track editing. Scott Pilgrim vs. The World: again, this is a combination of both the soundtrack and the score (as well as the many songs omitted from the soundtrack, which did take some tracking down!) arranged together to be in the order they were in the film. The films are pretty much the official expanded soundtrack releases. There are some "bootleg tracks" I once found online with The Motion Picture which, as you see, have their own folder. The Undiscovered Country also has some such tracks, but being less in number they are simply mixed in with the bonus tracks also presented on the official album. There are also two tracks I edited, to remove bits not heard in the film and which can be a bit jarring (in my opinion) when listening to them. One is Star Trek II's "Kirk's Explosive Reply" which in the film just fades away at the end, but on the soundtrack then comes back with a brief bombastic explosion. I removed that bit at the end. Then, during Star Trek III's "Stealing the Enterprise," there is this one cacophonous bit of music (apparently intended to cover a brief deleted scene) that to me has always interrupted the flow of the piece, so I removed that bit as well. But fear not, purists! The original versions are also present on my MP3 player. Transformers: this is the 1986 film, none of that Michael Bay smeg! Again, this is a blending of the albums for the soundtrack and the score, arranged in the order they were heard in the film. Indiana Jones: for the most part, these albums as presented on CD did have the music in film order. But there were a few minor exceptions: a couple omitted pieces of music that were included on a bonus disc in the boxed set, and a couple of pieces that on the album connected two separate bits of music. So tracks have been added in or edited and rearranged where necessary to get the music closer to how it was in the film. Star Wars trilogy: The music here is assembled mostly from two sources: the four disc "Star Wars Anthology" soundtrack release, and the two disc special edition soundtracks from each film. This allowed for the creation of "expanded soundtracks" for all three films and folders for the original albums of Star Wars and Return of the Jedi. For Empire, since the original album contained many much different arrangements, I actually had to find an illicit download of the vinyl version converted to MP3. (Since I had all three soundtracks on CD, I didn't feel too guilty about this download.) Tracks as appearing in the "Expanded Soundtrack" album are arranged as close as I could to adhere to the original versions of the films. The two pieces created for the special edition of Jedi, "Jedi Rocks" and "Victory Celebration," were relegated to the "Alternate Versions" folder. Huh... I ended up going on a lot longer then I thought I would! Anyway, hope some of this is of interest to you. I look forward to any comments on it. And also, I look forward to hearing what you've got!